How can you tell tell a good program from a weak program? We are often asked: How can you tell tell a good program from a weak program? The answer is simple. A strong program should be able to teach beginners and experts, gifted students and standard students, native speakers and ESL, and it should be able to do this across all categories of competition. We accomplished something that has never before been accomplished by any team at one of the biggest 3rd-12 speech events in the US. With more than 25 coaches, 10 locations, and competition wins from elementary school to college, we are the most comprehensive program in California. Whether you are new to speech or an expert, we can help you become the best performer in the world. This weekend, coach John Paul led Pacific Academy’s MUN to 6 awards at UC Berkeley’s Model Arab League, our Student Leadership Team raised $500 to support local speech and debate programs - adding to the $20,000 ModernBrain has raised for underserved programs, and our Elementary and Middle School students won 9 of the 10 top speaker awards at the Heideman Winter Invitational. Thank you to all of the parents and students who make this happen! Get ready for next year. Stanford, Berkeley, and Harvard... here we come! Join our winter camps now. Come and tryout for the national competition team. Be part of the largest and fastest growing speech and debate program. Congratulations to all our competitors! We’ve had 5 competitions this fall: SoCalMUN at SCC, Cal State Fullerton, The “Jack Howe” at Cal State Long Beach, Orange Coast College, and Irvine Valley College. No other team in California has even attempted to do this elite level of competition. But what is more important is that every one of the students started as a nervous beginner only a short time ago. We won Outstanding Delegation as the only high school team and top team at SoCalMUN, a college only MUN conference, 1st place (undefeated 5-0) in Policy debate at OCC, 1st place top speaker in Policy Debate at OCC, 1st place in more than 10 speech events at OCC, 1st place in novice high school POI (won by a 7th grader) at the Jack Howe @ CSULB one of the biggest and most difficult competitions in the US, a 6th grader won #3rd place in Novice high school extemp at the Jack Howe, we won more than twice the awards of any other team at Cal State Fullerton, and two top speaker awards at IVC. Our elementary students win against middle school competitions, our middle schoolers win at high school competitions, and our high school students win at university level events. It’s early October and we are off to a great start. Join our growing team. We are opening new classes in San Marino, La Cañada Flintridge, Eastvale, Dana Point, and even more new areas. Please ask us about our new coaches this fall. We’ve added some the best teachers in the world to our team. Coach Scott - 2 time NSDA Policy Debate coach of the year joined us as our head debate coach. He is one of the most successful debate coaches in history, coaching teams to national wins in Policy, LD, and Public Forum. There is no better debate coach in California. Coach Abigail - The winningest speaker in college competition history. Abigail has won 12 national championships in many different events. Abigail is such a great speaker that one year she tried a new event just for fun and won 2nd place in the US. On Saturday March 18th, ModernBrain took two debaters to the western regional qualifier for the Ronald Reagan Great Communicator Debate Series. After debating students from all over the western United States, our student is a western regional champion and among the top 16 in the US! He won the Leadership and the American Presidency scholarship from the Reagan foundation. When our student graduates high school he will receive a scholarship to study in Washington DC, access to jobs/internships at the White House, Congress, and the Supreme Court, and he will compete at nationals against the other regional champions for $40,000 in scholarships. Our student isn't even on his school debate team. It doesn't matter if your student is new to speech or a top debater, we can make them better and provide them with opportunities that no one else can. Speech and debate training also brings you real world opportunities like scholarships, internships, and jobs. 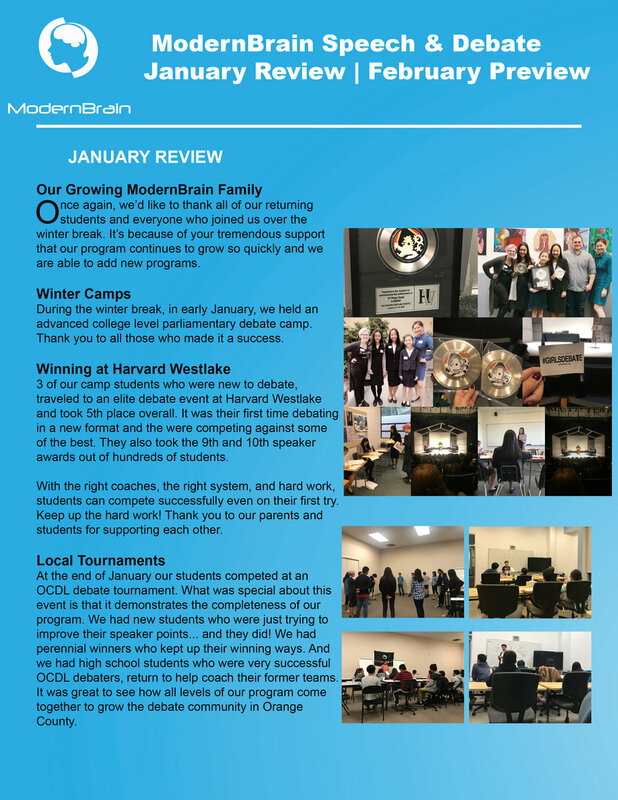 Congratulations to all ModernBrain student. Our students took 1st place overall in middle school and 3rd overall in elementary. We had students win in every category of speech: limited preparation, platform, interpretation of literature (acting), and debate. So proud of all of you! We attended the 2017 Irvine High School Multicultural Festival to meet students and parents. Student journalists interviewed the founder of ModernBrain Mr. Lewellen during this event. Thanks to Irvine High School for hosting this wonderful event and the journalist's hard work. Congratulations to our student's good performance at the 2017 IVC Winter Classic Debate Tournament. 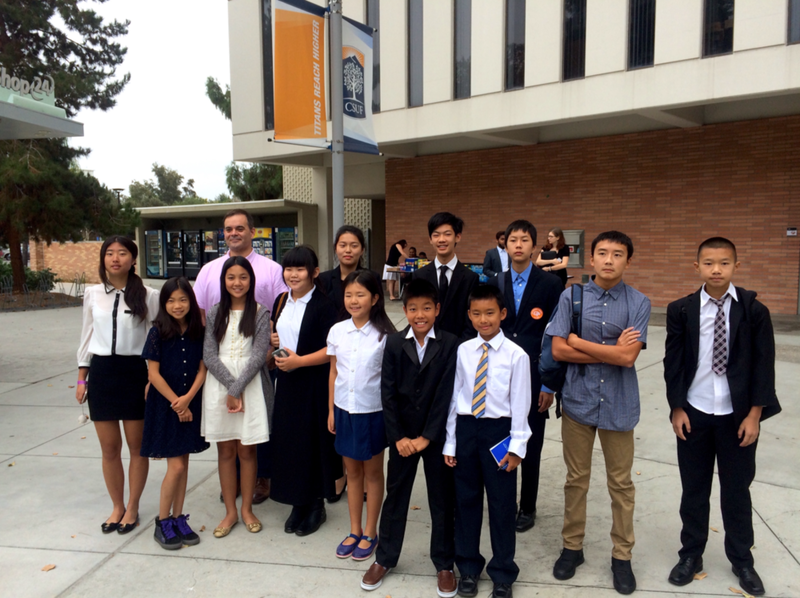 Congratulations to all of our students with your great performance and achievement at ACLA Sunshine in My Pocket Speech & Debate Tournament at CSUF on Aug.6, 2016.